A 3-in-1 hydrating mask, Leach Me moisturizes your skin, prevents signs of aging from appearing and restores your healthy glow. Bursting with natural fruity ingredients, this mask quickly penetrates your skin to nourishes it. Your lines will refine, your dryness will vanish, and the mirror will reveal a beaming face once again! Benefits: Long term deep moisturising, retains & replenishes moisture, age prevention, anti-oxidant & anti-bacterial, lightening & whitening effect. Sour Milk (Lactic Acid), Mandelic Acid, Xanthan Gum, Sodium Carboxymethyl Beta-Glucan, Chamomile (Matricaria recutita) Flower Extract, Algae Extract, Acetyl Hexapeptide-8, Sodium Hyaluronate, Co-enzyme Q10 (Ubiquinone), Hydrogenated Egg Yolk Phosphlipids, Acerola (Malpighia punicifolia) Fruit Extract, Alcohol Denat., Glycerin, Lecithin, Guar Hydroxypropyltrimonium Chloride, Fragrance, PPG-26-Buteth-26, PEG-40 Hydrogenated Castor Oil, BHA (Salicylic Acid), Diazolidinyl Urea, Methylparaben, Propylparaben, Imidazolidinyl Urea, Phenoxyethanol, Butylparaben, Ethylparaben, Isobutylparaben, Sulisobenzone (Benzophenone-4). How to Use: Use Leach Me 2-3 times weekly to boost skin hydration, brightness and prevent aging. After leaving it on for 20 minutes, my face felt renewed and moisturised after leaving it on for 30 minutes. It leaves my skin hydrated and my foundation did not flake off during the day. I would strongly recommend this to be applied if you’re going to apply heavy makeup on the next day (Yes! Especially to the Brides who wanted to look great on their big day). It moisturise, brightens your skin and most essentially, prevents signs of aging. 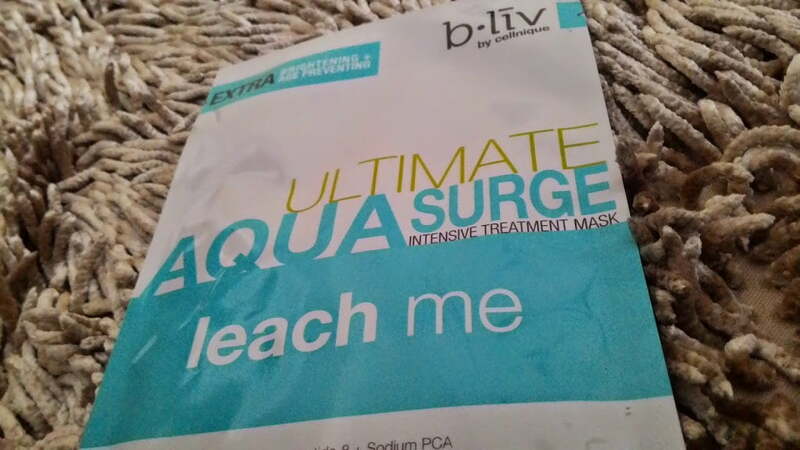 It makes my face hydrated and reduce the appearance of fine lines. The mask is very wet almost dripping in serum. The best way to use it was to lie down. It has no capability to stretch over your ears and neck like other facial mask sheet. You can also get this from SASA at RM9.90/sheet. I usually get mine from HiShop as I can get cheaper price at RM59.90 for 7 sheets, and with FREE DELIVERY for every order above RM50. B.Liv’s website also have this sold online, anyway.